All too often care is not only ineffective, it fails to meet evidence-based guidelines or is unsafe, said Dr. Kathleen Hill, Maternal Health Team Lead of USAID’s flagship Maternal and Child Survival Program (MCSP). The need for improvement is reflected in global maternal mortality rates that are dropping at only half the rate needed to achieve the related 2030 Sustainable Development Goals. “Improving quality should be at the center of expanding universal health coverage and reducing mortality rates,” said Hill. Over the last two decades, global healthcare coverage and access has expanded, but outcomes—such as morbidity and mortality rates—have not changed at the same pace, said Dr. Blerta Maliqi, Technical Officer, World Health Organization’s Network for Improving Quality Care for Maternal, Newborn, and Child Health (MNCH). For example, local evidence in Nigeria shows that areas with a high population of birth attendants did not translate into more safe births. “We have to stop measuring inputs and calling that quality,” said Kruk. Historically, global health efforts have focused on improving key system inputs, such as increasing commodities and building health facilities, to improve utilization and quality of health services, said Hill. Yet inputs alone, while essential, do not correlate with higher quality of care or better health outcomes. In fact, growing evidence suggests that quality gaps are behind stagnating maternal mortality rates, which has prompted countries to adopt quality improvement strategies to achieve better health outcomes. “We are thinking about how to save additional lives through delivering safe, effective, and respectful care, in addition to strengthening access,” said Dr. Jesca Nsungwa Sabiiti, Ministry of Health, Uganda. By adopting a systems approach, Uganda’s national government established a service delivery unit called, Hakuna Machezo, or No More Games in English, to ensure national quality standards are implemented and maintained in health facilities throughout the country. In Uganda, the institutionalization of quality assurance and improvement strategies has reduced morality by 30 percent within the past year, said Sabiiti. “We know that partnerships and leadership at all levels are crucial to improving quality of care,” said Dr. Chibugo Okoli, the Deputy Chief of Party, MCSP, Nigeria. 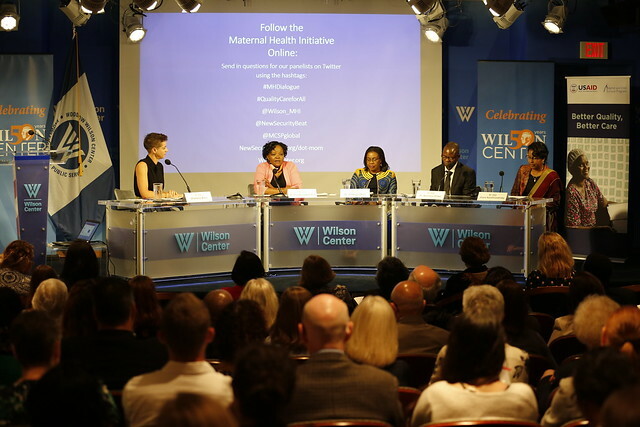 In an effort to reduce staggering maternal mortality rates, Nigeria adopted the WHO’s Network for Improving Quality of MNCH in 2015 and had state governments develop and implement quality improvement strategies aimed at re-organizing care to be “people-centered and expedient,” said Okoli. Coordinating national and state government agendas has helped improve maternal health indicators by, for example, boosting rates of breastfeeding and increasing the use of uterotonics to prevent postpartum hemorrhage. It has also helped reduce institutional mortality rates. Madagascar’s experience shows what a country can do in the early stages of a quality improvement initiative. It developed a roadmap to reduce maternal mortality rates by 2019 by collaborating with national, district, and facility-levels to target service delivery and health personnel training, said Eliane Razafimandimby, Chief of Party, MCSP, Madagascar. The country focused on improving care by routinely measuring blood pressure and ensuring post-partum family planning for all women. The effort involved tracking eight quality of care indicators monthly for three and a half years. As a result, maternal and infant mortality rates, which were previously higher than global standards, steadily decreased. Screenings for eclampsia via blood pressure screening rose from a baseline of 40 percent to 90 percent of antenatal care visits in just one year. “We were able to sustain this at this level until the end of the program,” said Razafimandimby. To ensure interventions stick, funders and partners need to be humble, said Dr. Sodzi Sodzi-Tettey, Executive Director, Africa Region, Institute for Healthcare Improvement. Early on they need to make a choice. Do they want a pilot project with breakthrough results that gets published in a journal and then they go away? Or do they really want to create a sustainable intervention that is owned by the country and integrated into its systems? “I think the question ought to be answered very early,” he said. Improving reproductive, maternal, and newborn healthcare requires a systemic approach that places quality at the center of health system governance and works across national, state, and facility levels to ensure the coordination of quality improvement strategies. The panelists unanimously agreed that improving quality of care requires strong partnerships, health system redesign and innovation, improved training curricula for health workers, and a concerted community demand for quality care. Policymakers and future studies should focus on the underlying factors that drive poor quality healthcare by documenting experiences of care, in addition to investing in local adaptation and sustainable interventions that engage all levels of governance and address both access and quality as key players in improving health outcomes. “We need to build capacity in local leaders to absorb quality of care interventions,” said Sabiiti. Many of the panelists agreed that it was time for taking fresh approaches, because old ones had not worked. “Doing things better means doing things differently,” said Dr. Boniface Onwe, Ministry of Health, Nigeria. Photo Credit: Pregnant women, mothers, and children wait to consult with nurses and doctors, March 6, 2018, courtesy of the Pan American Health Organization. For more photos from this event, see our Flickr album.